Obituary for Andrew "Andy" Menard Bartell | Hunter Funeral Home, Inc.
Andrew “Andy” Menard Bartell, who always said he’d live to be 100, surpassed his goal before passing away at age 102 on Wednesday, July 11, 2018 at the Golden Good Shepherd Home. He was formerly of La Prairie and the Elm Grove community. Andy was born on February 20, 1916 to Claus George Bartell and Alice M. Aden Bartell at their home in Chatton, near La Prairie, IL. He married Helen K. Dutton on February 25, 1939 in Palmyra, MO. They celebrated 71 years of marriage before her death on January 22, 2011. Andy attended the one-room Franklin School and graduated from La Prairie High School in 1935. He also completed the Dale Carnegie public speaking course. Andy was a lifelong Adams County farmer, who lived on and farmed his Grandfather Aden’s farm for nearly 75 years. 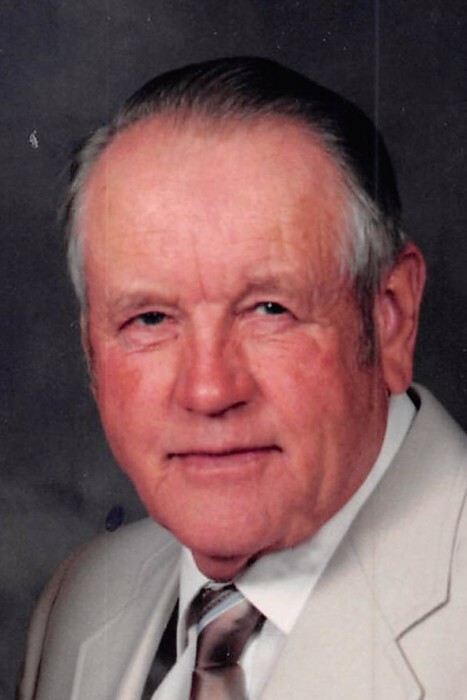 He enjoyed special times with his family, participating in community activities, attending pancake breakfasts and ice cream socials, and talking about farming with friends and neighbors. He enjoyed repairing his own farm equipment, helping his neighbors and, for many years, was one of the area’s largest hog farmers. He was usually seen around the area wearing one of many farm caps that he collected over the years. Andy was a member of Immanuel Lutheran Church, the Golden Lions Club and the Adams County Farm Bureau. He served his community as an election judge and as a member of the Immanuel Lutheran Church Council, Golden Good Shepherd Home Board of Directors, Northeast Township Board of Trustees, Adams County Soil & Water Conservation Board, ASCS County Committee, and the Northeast Township and Adams County ASC Boards. Surviving are his three daughters: Marilyn Bartell (Norman Bailey) of Sacramento, CA; Ruth (Dennis) Royalty of Carthage, IL; and Mary Jo (Sid) Huber of Auburn, IL. Andy’s four grandchildren are Sherry Roberts of Tupelo, MI; Marsha Roberts of Bowen, IL; Kevin (Emily) Royalty of Fitchburg, WI; and Sarah Royalty (Dave) Tredo of McLean, VA, and one step grandson Scott Huber of Coffeen, IL. Andy’s five great grandchildren include Cassandra Cohagan of Columbia, MO, Brandon and Duncan Royalty of Fitchburg, WI, and Vienna and Adelaide Tredo of McLean, VA. Also surviving are one niece, Nancy Huls, of Carthage, IL and several cousins. Andy was preceded in death by his parents and two brothers Menard and Melvin Bartell. Funeral Services will be 10:30 A.M. on Saturday, July 21, 2018 in the Immanuel Lutheran Church in Golden with Reverend Patricia Reep officiating. Interment will be in Immanuel Lutheran Cemetery in Golden. Visitation will be from 4:00 P.M. until 7:00 P.M. on Friday July 20, 2018 in the Hunter Funeral Home in Golden. Memorial contributions have been suggested to Immanuel Lutheran Church, Golden Public Library or Blessing Foundation for Hospice. You are invited to share memories and leave condolences at www.hunterfuneralhomes.com.